I learned this traditional recipe of Karnataka from my neighbour who is from Coorg, Karnataka. Though we make sweet samosas also known as somasis during the festival time the stuffing that we use is completely different from what they use. They both look alike but vary in taste. She told me that the Coorg cuisine is most popular for non-vegetarian dishes which use mainly pork but their sweets are very rich in taste and also famous all over Karnataka. After making this when I gave her some for tasting she told me that I had gotten the taste correctly which made me quite happy. I had followed her quantity of the ingredients and instructions to the dot. They make this sweet dish during the durga pooja celebrations and also during Diwali. So here goes the recipe…….. In a mixing bowl mix the maida and salt together and rub in a little ghee. Add little water and knead them into dough. The dough should be tight. Keep it aside. Grate the jaggery and coconut and keep it aside. In a heavy bottomed pan melt the ghee, add the grated jaggery, coconut, sugar, crushed cardamom and mix them together. Keep stirring over a low flame till the jaggery and sugar melts completely and all of them get mixed and form a ball shape. Remove from flame and let it to cool. Make small lemon sized balls from this mixture. Divide the dough into balls and roll them out into puris. Place one ball of the sweet mixture on one half the puri and fold the other part over the small part into a crescent shape and seal the edges with small twists provided you have the patience and experience to manage these twists. I used a karjikai or samosa mould for this to make my work easier. If you are using the mould, grease the insides with a little ghee or oil and place the poori into the mould, place the sweet ball on one half and lock and press the mould. Make sure that the puris are bigger than the mould so that it will be easier for you to take out the extra dough that comes out of the mould to get a perfect shape. Heat the oil in a kadai and deep fry these puris over a medium flame till they become golden brown in color and serve hot. you can decorate it with silver warq paper as I have done on top while the kajirakais are still hot. 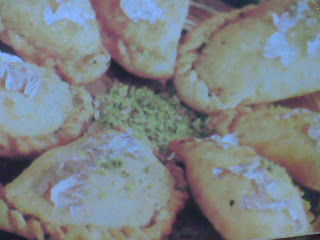 Thank you Radhika – I usually make a typically North Indian filling for my ‘gujiyas’! This promises to taste great! I love these sweets. We call them Kajjikayalu in Telugu. We usuallly stuff dalia mixture in these. Looks lovely radhika! Thanks for the lovely entry radika..